Holy cow, things have been nuts around here lately! I have a pile of posts that should be getting posted and have had no time to post them! I think I might have a few minutes to do some posting today, so as promised, we’ll start with another fun giveaway from our friends at campingsurvival.com . The packets are resealable, so you can plant some now and some later, and the can includes complete planting instructions. Very cool. I want some. For more information, visit campingsurvival.com’s information page here. The giveaway will end on Thursday, December 24th at 11:59 pm and the winner will be contacted by campingsurvival.com for their shipping information. Good luck! So I entered the contest…but I also have to say that I LOVE that you posted this link! 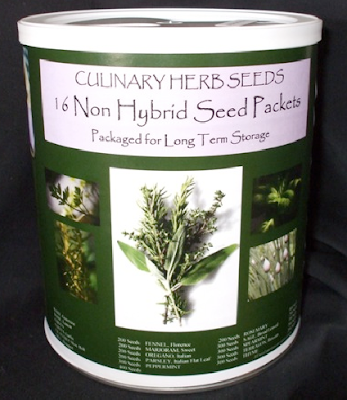 I have a ton of dried herbs but the thought of going without fresh herbs for a long period of time would almost kill me! I love what you do!